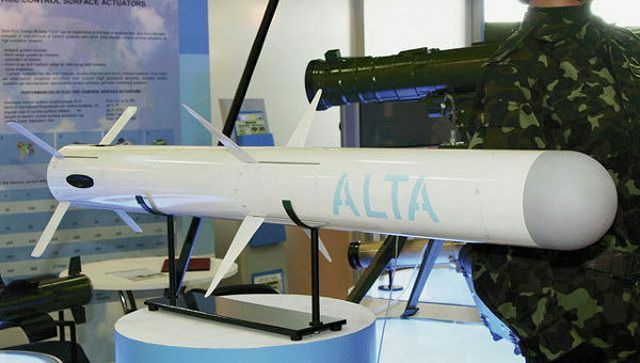 Ukraine on Friday, September 26, presented the first indigenous surface-to-air missile Alta, reports the Ukrainian public consortium Ukroboronprom. "The versatile missile Alta, the first missile designed entirely in Ukraine that uses a dual guidance, aroused the greatest interest" of visitors at the international exhibition "Weapons and Security 2014", which takes place in Kiev from September 24 to 27, announced the consortium in a statement. Two meters long and weighing 55 kg, the Alta missile has a range of 7.5 km. According to the consortium, the missile is capable of destroying armored moving and fixed targets thanks to laser and guidance system. At the same time, the consortium has not announced anything about his plans for delivering new weapons to the Ukrainian armed forces. Ukrainian President Piotr Poroshenko said on Thursday, September 23, during his first major press conference, that Ukraine would increase military spending from 1.02% to 5% of GDP by 2020.